I got my first garage freezer about 6 months ago, and it has changed my life. That sounds dramatic, but it really has changed the way I plan, shop, think, and the meals I turn out as a busy mom. My freezer in the kitchen is a lower drawer style, and the food gets lost in the abyss since I can’t clearly see what I have, and space is limited. Our garage freezer is a stand up style with shelving, so I can organize it much easier and use it to make my life better. I always have a frozen lasagna and a few Trader Joes meals in there, for busy nights when I just don’t have a plan or my plan has gone out the window. I store a gallon of Costco milk, extra loaves of bread and smoothie ingredients in that outdoor freezer as well. But the reason I’m talking about my garage freezer today is because it revolutionized the way I prepare for and pack school lunches for my kids. I usually make a loaf at a time, and freeze them cut in half inside a ziplock. I clean my kitchen table carefully and then lay out all the bread at once. I put a thin layer of peanut butter on all the slices of bread. 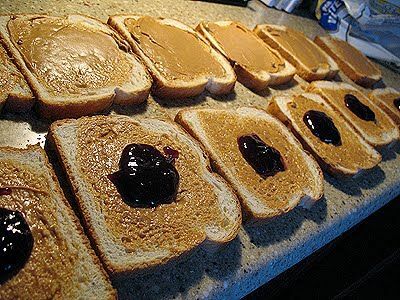 This is important as the PB layer acts as a barrier so the jelly doesn’t seep through the bread as it thaws. Then add jelly to half the pieces, assemble them and cut in half. We use these for school lunches often, and I’m always surprised how quickly they go when I grab 4 on Saturday outings as a family. One of my most genius moves of all time- the giant sandwich roll. I buy the 2 pack of Hawaiian Rolls from costco, and since they’re baked in one big pan, you can use a large serrated knife and cut open all the rolls together with just one slice. 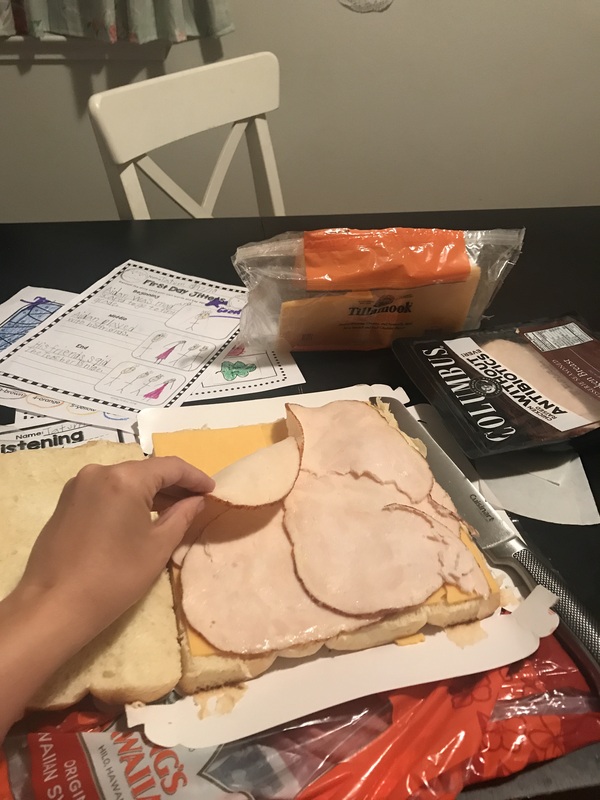 Then I make it like one giant sandwich, laying out the cheese and 4-6 slices of high quality lunch meat. I don’t think mustard and mayo freeze well, and my kids don’t like those anyway. The hawaiian rolls are made with so much butter I don’t think it needs it, but I do not include condiments FYI. 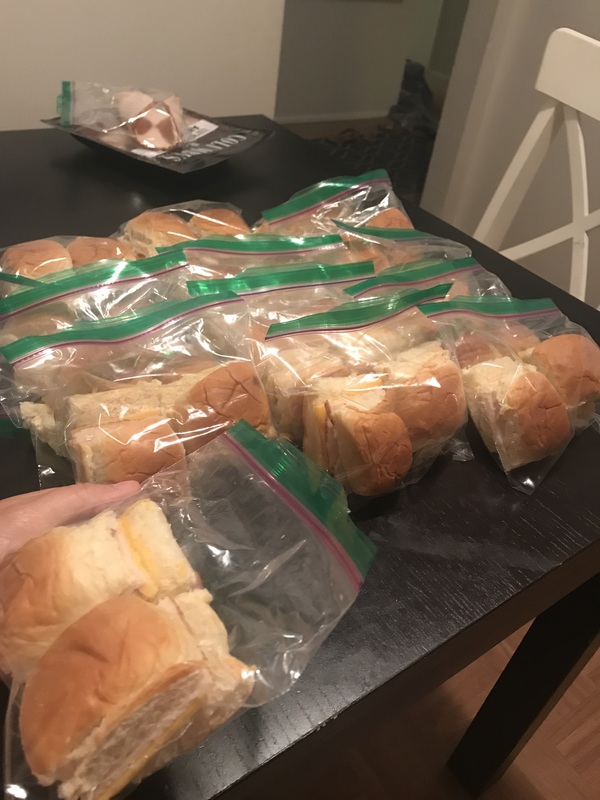 It took me 10 minutes total to make 2 giant sandwiches, which yields 32 sandwich rolls. You just can’t beat that! 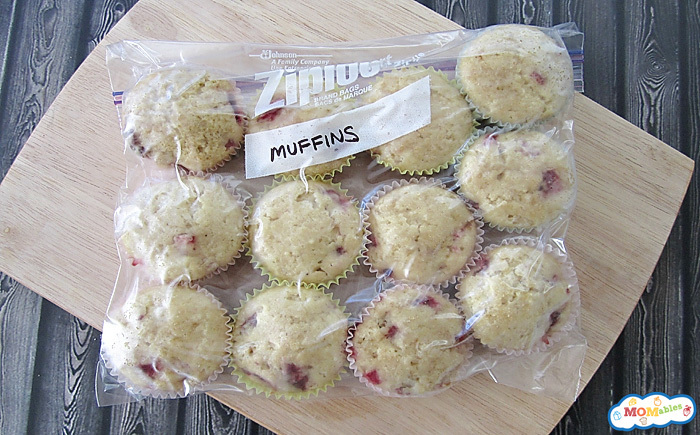 Use your favorite muffin recipe or buy store bought muffins. Either way, they freeze great and give your child a change of pace in their lunches without any last minute work on your part. I’m just glad I learned this trick by 1st grade, though I’m sad I went an entire year making lunches from scratch each morning! I also freeze gogurts and cheese sticks, as they freeze great and thaw out between when I pack the lunch at 7:30am and the time she eats at 11:30. You may find you can freeze lots of sides. An added benefit is that your kids won’t see them in the pantry or refrigerator, so they won’t get eaten up as quickly and will last longer for more lunches. It feels like anything is possible with freezer space! Try out these ideas or hop on Pinterest yourself and look for some options that are appealing for your family!